16 of my Life Studies quilts, plus the Angry Goat Prince painting will be at The Children’s Art Factory for the next few weeks. This entry was posted in art exhibits, life studies on February 17, 2012 by dahlia. Once I am all ready for Christmas, I start thinking about the new year. I love the beginning of a new year. I’m not generally the type to party the night away on New Year’s Eve; instead I am happily dealing with the loose ends of the old year, so I can start anew on New Year’s Day. Apparently this sentiment also applies in the studio. I have spent the past few weeks finishing projects: the sea creature quilt for my little girl’s room, and the eight small quilts that were in progress. I am ready to start anew. It is not lost on me that January is named for the Roman god Janus, who could look forward and back at the same time, given that he had two faces. I might not have two faces, but the end of one year and the beginning of the next provides a good vantage point for reviewing the past and using it to inform the future. This past year, particularly in the past six months, I have accomplished much in the studio. I have created several pieces in my Life Studies series; in doing so, I have improved my skills and clarified what most appeals to me in these works. 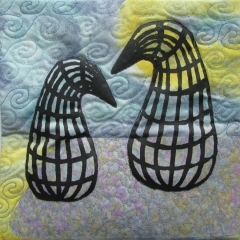 There are three quilts in the series that I am truly thrilled with. Looking at these together, I can see several common elements: strong lines, strong emotion, high contrast, complexity, and vibrant, warm colors. I didn’t see this, until I looked at all the pieces together. Now I have this understanding, I can see that it will change my upcoming work significantly. I have been exploring more with surface design; screen printing, using resists, and over dyeing. I have also made drawing a regular practice, and I have just started down an exciting new path combining doodling and surface design. I don’t know quite where it will lead yet, but I can’t wait to figure it out next year. I aim to start 2012 with a month or two of very messy play, creating a good stack of fabrics and fine tuning my dyeing and painting techniques. I will be starting work on my Life on Mars series, with both imaginary plants and animals, and those that are so bizarre they might as well be from another planet. I will be drawing regularly still, improving my abilities there. This entry was posted in life studies, musings on December 23, 2011 by dahlia. I feel ready to tackle some more complex ideas. Working on these simple designs is very useful for exploring various principles, and seeing their effects. Yet I am not so satisfied with that right now, and I want to do more. I feel the need to create, create, create some more. Develop 20, 30, 40 scenes, and hopefully at the end have a better grasp of what I want to do, and how I want to do it. But how to do it? Part of me is drawn to the idea of acrylic on canvas, and just keep painting on top. It seems like a good way to get ideas down. Though I am already out of space, and I don’t want to buy more paint. So sketchbook it is. I’m tempted to choose a sentence (current contender is “Life on Mars”), and illustrate it in all the ways I can think of. This entry was posted in life studies, musings on November 17, 2011 by dahlia. I don’t know quite what it is about Fall that derails me. The abrupt changes in weather, the first colds for us all, the inevitable last-minute sewing for Halloween, when minds get changed. Even though I’m still accomplishing something in the studio most days, it feels much slower and less productive than usual. And my heart just isn’t in it. For instance, these guys were finished a week ago, and yet I haven’t taken the few minutes to post them. Once I had these guys all complete, I realized I must have miscalculated when it came to the final trimming and sewing, and they looked very misbalanced (I blame lack of sleep). It gave me the perfect opportunity to add the moon, and to try a technique I had wanted to, for a while. The moon is fusible webbing painted with acrylic paint, which gives it a lacy uneven look which is perfect to give that lunar quality. As I was finishing up this piece, I got to pondering the sizes of my small works. To date they have been 9″ x 9″. However, this size is often a challenge, given that the natural width of a bolt of fabric gives me initial pieces of 11″ x 11″. When I cut stencils, my source material is 12″ square, but I can’t cut close to the edges. In short, it would make far more sense to work to 8″ square. However doing so leaves me with the first 15 or so works in the series as larger than the rest. I ultimately decided I was ok with that. It could be that decisions like this are part of what holds me back in the studio. Also the ambiguity lately. It has been very helpful to spend a few weeks focusing more on art principles, and drawing, doodling, sketching, and designing. And while I have assimilated those into my regular studio time easily enough, I feel a lot of uncertainty over the right balance between practice & exploration of ideas (whether on paper or digitally), and turning those ideas into finished quilts. I generally need to remind myself that I am doing this for me, and me alone. And so what do I want? This entry was posted in life studies, musings on November 5, 2011 by dahlia. Another iteration of these lovely creatures, with a high contrast between the figures and ground, and with twice the layers of batting in the trapunto, to give them a lot of depth. I need to fine tune my lighting for these photos; this one shows the depth better because it is lit from the side, but it wasn’t lit enough and is therefore a little blurry. This entry was posted in life studies on October 8, 2011 by dahlia. I am appreciating the slow paced aspect of drawing and sketching, it is more relaxing than a lot of what I do. I think it will be very good for me to spend more time on it. This entry was posted in life studies on October 1, 2011 by dahlia. Adding these shadows definitely helps to give the creatures more depth in their environment. The monochromatic orange really appeals to me too. This entry was posted in life studies on September 17, 2011 by dahlia. Another little doodle of mine. I love these little guys. The grownup seems so overbearing, and the little guy simply bewildered. I quilted these with a thick aurifil thread, which was wonderful to work with. I enjoyed the quilting more than I usually do. This entry was posted in life studies on September 10, 2011 by dahlia. The latest in the series. I do like the colours in this one, but being the lightest value, the eye is really drawn to the mother, not the child. An interesting variation, I think. This entry was posted in life studies on September 3, 2011 by dahlia.